Concept Name: Ardea Alba Nationality: Italian College of Education: IED Milan _About the design: _ The design of this luxury yacht was inspired by the elegant “S” shaped head of an Ardea Alba. The main central body has glass windows which while offering a 360° view and allowing maximum light are also shaded from direct sunlight by the yacht’s overlapping wings. This minimalist design offers its passengers a complete being at sea experience. The two tenders have the same style. The main body of the limousine tender is closed and transparent allowing the guest to see all around while protecting them from the elements. 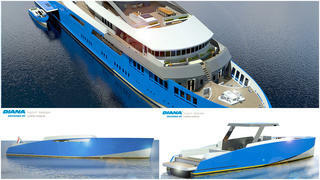 The second tender is smaller, open and sportive in design. The design of this luxury yacht was inspired by the elegant “S” shaped head of an Ardea Alba. The main central body has glass windows which while offering a 360° view and allowing maximum light are also shaded from direct sunlight by the yacht’s overlapping wings. This minimalist design offers its passengers a complete being at sea experience. The two tenders have the same style. The main body of the limousine tender is closed and transparent allowing the guest to see all around while protecting them from the elements. 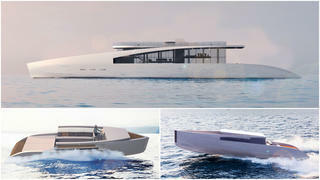 The second tender is smaller, open and sportive in design. Concept Name: 80m Trimaran Design Nationality: British College of Education: Coventry University _About the design: _ With the 80 metre trimaran design, the yacht has the ability to make the most of large exterior decks, while maintaining a vast main saloon, equipped with panoramic port and starboard sliding doors, and dynamic forward facing windows in the outriggers allowing the owner to glide over the water. The sleek modern profile of the yacht gives room for covered tender docking under the outriggers, while opening to form large port and starboard superyacht beach clubs. Atop the yacht is the sundeck, complete with lounge space, hot tub, fire pit, and 10m bar for entertaining into the evening. Sleek, modern and stylish. 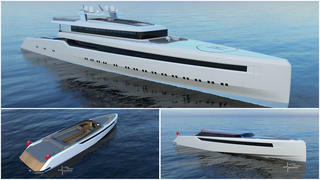 With the 80 metre trimaran design, the yacht has the ability to make the most of large exterior decks, while maintaining a vast main saloon, equipped with panoramic port and starboard sliding doors, and dynamic forward facing windows in the outriggers allowing the owner to glide over the water. The sleek modern profile of the yacht gives room for covered tender docking under the outriggers, while opening to form large port and starboard superyacht beach clubs. Atop the yacht is the sundeck, complete with lounge space, hot tub, fire pit, and 10m bar for entertaining into the evening. _Concept Name: _Comète Nationality: French _College of Education: _Politecnico di Milano _About the design: _ The aim of the Comète Project was to achieve the perfect balance between elegance and sporty lines, while being exceptionally comfortable and functional.The mother boat Comète is made to live outside. Two full glass pools surround a spectacular flying stair to welcome you onboard. Guests can enjoy the ultra-private space at the bow, which is fully open to feel the sea even closer. Halley Limo is the best compromise between outside and inside comfort, while enhancing her mother boat style. Finally, Biela Cruiser offers the maximum space to relax and have fun. She has a huge free open space to bring on board the craziest toys you want for your cruising day. The aim of the Comète Project was to achieve the perfect balance between elegance and sporty lines, while being exceptionally comfortable and functional.The mother boat Comète is made to live outside. Two full glass pools surround a spectacular flying stair to welcome you onboard. Guests can enjoy the ultra-private space at the bow, which is fully open to feel the sea even closer. Halley Limo is the best compromise between outside and inside comfort, while enhancing her mother boat style. Finally, Biela Cruiser offers the maximum space to relax and have fun. She has a huge free open space to bring on board the craziest toys you want for your cruising day. Concept Name: Superyacht RP80 Nationality: German College of Education: Braunschweig University of Art (HBK) _About the design: _ The superyacht "RP80" is defined by a few flowing and sharp design lines which stretch the length of the yacht. My intention was to combine boat design with automotive surface treatment. The yacht has stunning proportions with an elegant floating superstructure made from switchable and dimmable smart glass to give a clean and sculptural appearance. The yacht houses two 10 metre tenders which are unique. The first one is a limousine tender which really flies over the water thanks to retractable foils. To increase the visual effect of flying over the water the centre bottom of the interior lounge is designed to be transparent. The second tender is an open tender for exploration. When anchored the side-bulwarks can be folded down to increase usable deck space for sunbathing. All three boats follow the same design language that make them truly recognisable of the same kind. The superyacht "RP80" is defined by a few flowing and sharp design lines which stretch the length of the yacht. 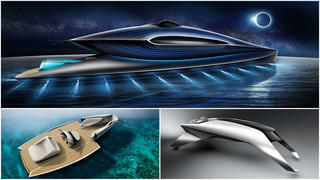 My intention was to combine boat design with automotive surface treatment. The yacht has stunning proportions with an elegant floating superstructure made from switchable and dimmable smart glass to give a clean and sculptural appearance. The yacht houses two 10 metre tenders which are unique. The first one is a limousine tender which really flies over the water thanks to retractable foils. To increase the visual effect of flying over the water the centre bottom of the interior lounge is designed to be transparent. The second tender is an open tender for exploration. When anchored the side-bulwarks can be folded down to increase usable deck space for sunbathing. All three boats follow the same design language that make them truly recognisable of the same kind. Concept Name: Matrix Nationality: British College of Education: Coventry University _About the design: _ Matrix is an elegant superyacht inspired by sleek automotive styling. It features strong simple lines, with a clear design DNA that is consistent among the tenders. The sun deck is a great place to socialise with its art deco style bar and swimming pool, whilst the guest deck creates a cosy environment for quiet evenings around the fire pit. The owners can find refuge on their personal deck with the contemplation pool, and the highly customisable party deck at the front is perfect for soirees and celebrations. Matrix’s signature is its elegant windscreen and hull coloured tumblehome which uses unique tinted glass to create a seamless effect. 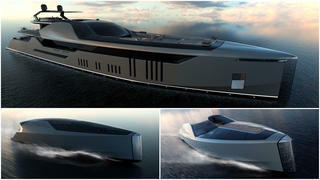 Matrix is an elegant superyacht inspired by sleek automotive styling. It features strong simple lines, with a clear design DNA that is consistent among the tenders. The sun deck is a great place to socialise with its art deco style bar and swimming pool, whilst the guest deck creates a cosy environment for quiet evenings around the fire pit. The owners can find refuge on their personal deck with the contemplation pool, and the highly customisable party deck at the front is perfect for soirees and celebrations. Matrix’s signature is its elegant windscreen and hull coloured tumblehome which uses unique tinted glass to create a seamless effect. Concept Name: Olokun _Nationality: _Spanish College of Educatio_n: _IED Barcelona _About the design: _ Olokun, with 80 metres in length overall, is defined as a futuristic yacht with a low profile, providing a dynamic silhouette to the yacht’s external appearance. The major challenge of this concept was the development of the exterior design and the layering of the decks, since I wanted to provide a feeling of privacy from outside, without compromising views from inside. The main deck, where the outdoor dining area has been placed and exterior relaxation spaces are plentiful, features a large Jacuzzi followed by an infinity glass-bottom swimming pool located aft of the upper deck with a waterfall flowing between the two levels. On the other hand, the sundeck offers a cinema under the stars and a big sunbathing area, in a flexible space suitable for different purposes; including as a helipad. Furthermore, it has a big opening garage on both sides, storing two one-off design nine metre tenders; moreover it can be transformed into a beach club to offer the best sea experience to guests. Olokun, with 80 metres in length overall, is defined as a futuristic yacht with a low profile, providing a dynamic silhouette to the yacht’s external appearance. The major challenge of this concept was the development of the exterior design and the layering of the decks, since I wanted to provide a feeling of privacy from outside, without compromising views from inside. The main deck, where the outdoor dining area has been placed and exterior relaxation spaces are plentiful, features a large Jacuzzi followed by an infinity glass-bottom swimming pool located aft of the upper deck with a waterfall flowing between the two levels. On the other hand, the sundeck offers a cinema under the stars and a big sunbathing area, in a flexible space suitable for different purposes; including as a helipad. Furthermore, it has a big opening garage on both sides, storing two one-off design nine metre tenders; moreover it can be transformed into a beach club to offer the best sea experience to guests. Concept Name: Akira _Nationality: _Turkish Current Employer_: _Karatas Yacht Design _About the design: _ Flying was always the dream of mankind and sailing is one of mankind's longest professions; sailing like a flying bird on seas and oceans has always been tempting and seemed elegant for ages. Inspired by the black skimmer bird, Project Akira is developed to sail exquisitely around the globe like a graceful creature of nature that nicely blends with sea environment. A minimalistic approach is executed to achieve both a modern and naïve look by using simple geometries and long curves continuing along the yacht. 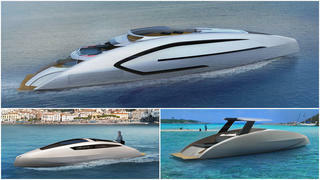 Hopefully well-thought elegant yacht is created to fulfil a visionary and wishful owner’s requirement. Flying was always the dream of mankind and sailing is one of mankind's longest professions; sailing like a flying bird on seas and oceans has always been tempting and seemed elegant for ages. Inspired by the black skimmer bird, Project Akira is developed to sail exquisitely around the globe like a graceful creature of nature that nicely blends with sea environment. A minimalistic approach is executed to achieve both a modern and naïve look by using simple geometries and long curves continuing along the yacht. 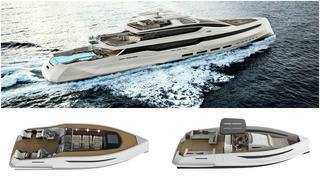 Hopefully well-thought elegant yacht is created to fulfil a visionary and wishful owner’s requirement. Concept Name: MY Hearsay _Nationality: _French Current Employer: Freelance Designer _About the design: _ Hearsay is a unique and sleek yacht, designed to be extremely comfortable and fun while being as unobtrusive as possible for the environment and the people she meets. Every part of this yacht has been designed to be comfortable and entertaining as well as extremely functional. Her tenders were designed to meet the perfect functionality for each dedicated use and to be ambassadors of the mother ship. There for the design of those two tenders are a reflection of the mother ship’s style and spirit. The Limo tender was designed to be a VIP transport with exclusive access and comfort where the SU Tender (Sport & Utility Tender) was designed to be multi-purpose. An exquisite day-cruiser, it can be reconfigured for extreme crew utilities. Hearsay is a unique and sleek yacht, designed to be extremely comfortable and fun while being as unobtrusive as possible for the environment and the people she meets. Every part of this yacht has been designed to be comfortable and entertaining as well as extremely functional. Her tenders were designed to meet the perfect functionality for each dedicated use and to be ambassadors of the mother ship. There for the design of those two tenders are a reflection of the mother ship’s style and spirit. The Limo tender was designed to be a VIP transport with exclusive access and comfort where the SU Tender (Sport & Utility Tender) was designed to be multi-purpose. An exquisite day-cruiser, it can be reconfigured for extreme crew utilities. Concept Name: MY Equal Nationality: Dutch Current Employer: Diana Yacht Design B.V. _About the design: _ The design of MY Equal is based on the owners request of having a yacht with two equally good looking tenders. The tenders should complement the exterior styling of the yacht so that’s where I started this design task. The result is a low profile 80 metre yacht with dedicated decks for (water) sports, parties, relaxing and an evening around the fireplace. The owner will be able to get to this luxury with an amazing limousine tender and board in comfort and safety due to the easy access boarding system. The second sporty general tender can be used for fishing and day long exploring. All bring there equal shares to the owners yachting experience. Current Employer:Diana Yacht Design B.V. 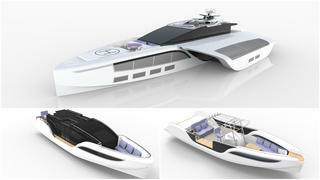 The design of MY Equal is based on the owners request of having a yacht with two equally good looking tenders. 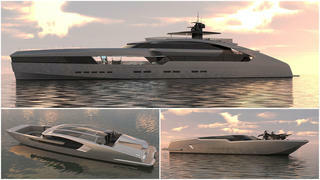 The tenders should complement the exterior styling of the yacht so that’s where I started this design task. The result is a low profile 80 metre yacht with dedicated decks for (water) sports, parties, relaxing and an evening around the fireplace. The owner will be able to get to this luxury with an amazing limousine tender and board in comfort and safety due to the easy access boarding system. The second sporty general tender can be used for fishing and day long exploring. All bring there equal shares to the owners yachting experience.